Location: Valid in all KFC restaurants in Malaysia except KLIA, KIA, KKIA, LCCT, Mall of Medini Legoland and Genting Highland. 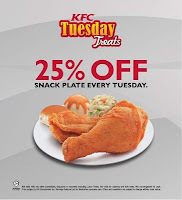 25% OFF KFC Snack Plate every Tuesday! Your Tuesdays will never be the same again with KFC's Tuesday Treats! 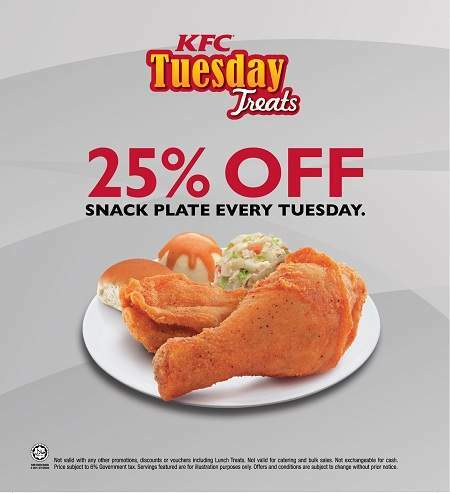 Get a 25% off KFC ala-carte Snack Plate any time of the day after Breakfast hours! *Limited to 5 ala-carte Snack Plate per customer, per order only. Valid in all KFC restaurants in Malaysia except KLIA, KIA, KKIA, LCCT, Mall of Medini Legoland and Genting Highland. Offer is valid for ala carte Snack Plate ONLY. Offer is valid on Tuesdays ONLY during non-breakfast hours. Not valid for catering and bulk sales. Not valid with any other promotions, discounts or vouchers including Lunch Treats. Price subject to 6% Government Tax. Limited to 5 snack plate ala carte per customer.